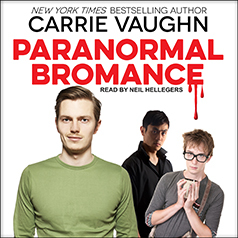 Paranormal Bromance is set in the world of Carrie Vaughn's bestselling Kitty Norville series. Sam has been a vampire for fifteen years, and now he's having a midlife crisis. That is, if he were still human, he'd be turning forty and having a midlife crisis. He's just met exactly the kind of woman he's always wanted—but these days, all he really wants is blood. Maybe he could work through it, but his vampire roommates just don't understand. Wasn't unlife supposed to get easier?